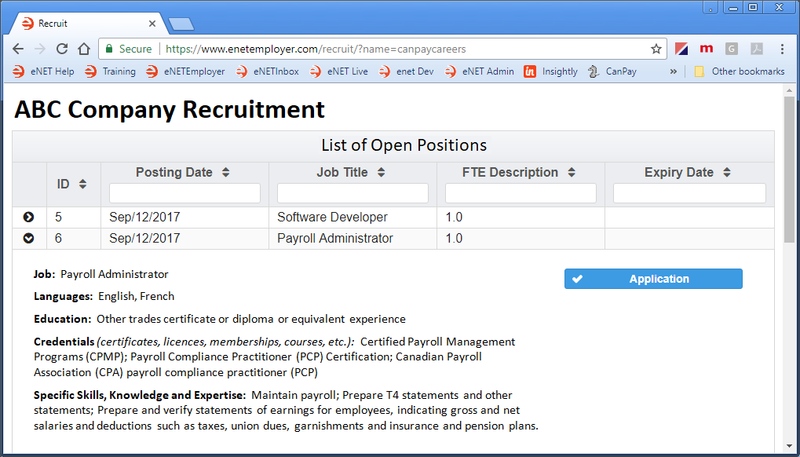 CanPay is proud to announce eNETEmployer's newest enhancement, Job Recruitment. Now you can create online job questionnaires and post them to your company's "Careers" web page. When a prospective employee applies for the job, your HR administrator receives an email notice and can view the submitted responses, resumes and other associated files. Weighted Scoring - Job questionnaires can have as many questions as needed, and each question can be weighted for the automatic calculation of each applicant's overall score. This saves you the time of reviewing numerous job applications - simply watch for an applicant whose score meets your objectives, then contact them for an interview. Resumes and Attachments - During the job application process, prospective employees can attach their resume and other documents associated with the job. If you would like to use the Recruitment feature to enhance your employee-hiring process, please send an email request to sales@canpay.com. We will activate the feature for your account and you can begin recruiting your employees online immediately! Recruitment is available for eNETEmployer software users. https://www.enetemployer.com.